Making laboratory work easier and more efficient, this round bottom glass flask guarantees precision results and optimal performance. 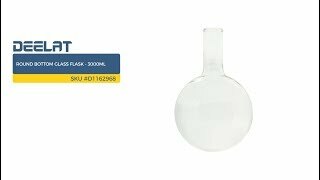 Suitable for use in all professional or educational labs, this flask is made from clear glass, making it possible to see the contents and any changes that take place during the testing process. Medical practitioners love this flask due to its high quality manufacturing, which makes the flask a durable and reliable addition to any lab.